The main difference between essential and nonessential fatty acids is that our body cannot produce essential fatty acids whereas our body can synthesize nonessential fatty acids through various biochemical reactions. Essential and nonessential fatty acids are two types of fatty acids whose classification originates from the body’s ability to synthesize fatty acids. Furthermore, the two types of essential fatty acids are linoleic acid and α-linoleic acid while there are various nonessential fatty acids including arachidic acid, stearic acid, and palmitic acid. Essential fatty acids are the type of fatty acids which cannot be synthesized by the body. That means; we need to include essential fatty acids in our diet. The two essential fatty acids in the human body are linoleic acid (LA) and α-linoleic acid (ALA). 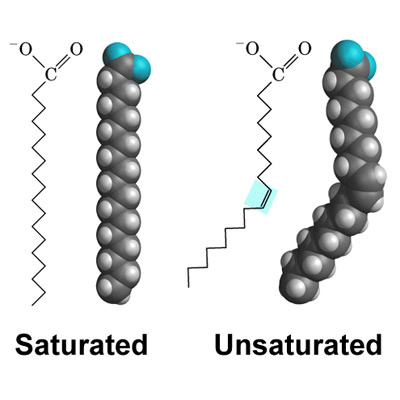 Both of them are short-chained polyunsaturated fatty acids with 18 carbon-long hydrocarbon chains. Here, the linoleic acid is an omega-6 fatty acid. It contains two double-bonds that are set apart by two single bonds. The main sources of linoleic acid are nuts and fatty seeds like poppy, sesame, hemp, and flaxseed. On the other hand, α-linoleic acid is an omega-3 fatty acid. It contains three double-bonds separated by three single bonds. The main sources of α-linoleic acid are walnuts, seeds like chia, hemp, and flaxseed, and vegetable oils. Nonessential fatty acids are the other type of fatty acids the body can synthesize, either through various biochemical reactions or converting the essential amino acids such as alanine, asparagine, aspartic acid, cystine, glutamic acid, glutamine, glycine, proline, serine, and tyrosine. Therefore, their presence in the diet is not essential. Nonessential fatty acids are either saturated fat or unsaturated fat. The fatty acid chain of the saturated fat only contains single bonds between carbon atoms. Saturated fat is bad fat since it can lead to atherosclerosis and heart disease. It exists as a soild in the room temperature and most of the animal fat is saturated. On the other hand, unsaturated fatty acids contain at least one single double bond in the hydrocarbon chain. It is good fat since it can increase the HDL levels in the body. Generally, unsaturated fat occurs as liquids in the room temperature. Most plant fats are unsaturated. Essential and nonessential fatty acids are the two types of fatty acids classified based on the ability of the body to produce them. Both consist of long hydrocarbon chains with a terminal carboxylic group. Also, both have a role in the formation of triglycerides. Essential fatty acids refer to unsaturated fatty acids that are essential to human health, but cannot be manufactured in the body while nonessential fatty acids refer to any of various amino acids that are required for normal health and growth, that can be synthesized within the body or derived in the body from essential amino acids. So, this is the fundamental difference between essential and nonessential fatty acids. 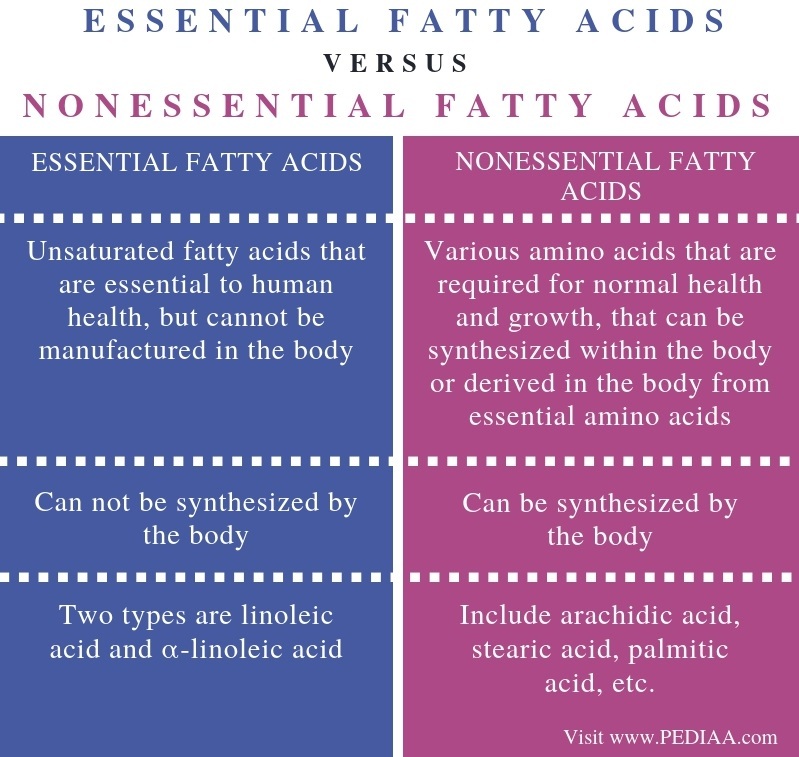 Simply, the difference between essential and nonessential fatty acid is that our body cannot synthesize essential fatty acids, but it can synthesize nonessential fatty acids. The two types of essential fatty acids are linoleic acid and α-linoleic acid while some nonessential fatty acids include arachidic acid, stearic acid, palmitic acid, etc. Essential fatty acids are the fatty acids that cannot be synthesized by the body. The two types of essential fatty acids are linoleic acid and α-linoleic acid. They have to be included in the diet. On the other hand, our body can produce nonessential fatty acids through metabolic reactions. These fatty acids are either saturated or unsaturated fats. Therefore, the main difference between essential and nonessential fatty acids is the ability of the body to synthesize them.